For other uses, see Khanate (disambiguation). After Genghis Khan established appanages for his family in the Mongol Empire during his rule (1206-1227), his sons, daughters, and grandsons inherited separate sections of the empire. 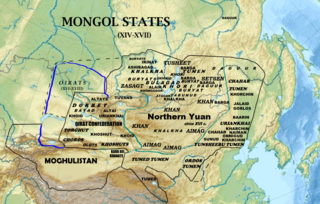 The Mongol Empire and Mongolian khanates that emerged from those appanages are listed below. Furthermore, the proto-Mongols also established some khanates (or khaganates) such as the Rouran Khaganate. Northern Yuan dynasty based in Mongolia. Dzungar Khanate, formed in 1634, covering Xinjiang region of China, Kyrgyzstan, eastern Kazakhstan and western Mongolia; 2 December 1717 - 1720 also styled Protector of Tibet; 1755 tributary to the Manchu Qing dynasty, 1756 annexed and dissolved in 1758. 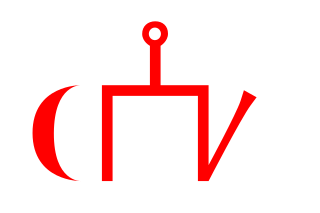 Volga Bulgaria, predecessor to the modern Chuvash Republic and the Chuvash people. First Bulgarian Empire, which started as a Turko-Slavic state, also known as Danube Bulgaria (in contrast to Volga Bulgaria, as both were established by members of the same Bulgar clan), but later became fully Slavicized and a Tsardom. Khanate of Kazan – The Mongol term khan became active when the Genghizide dynasty was settled in Kazan Duchy in the 1430s; imperial Russia added to its titles the former Kazan khanate with the royal style tsar. Bukey Horde, Bokei or Buqei; also known as the Inner or Interior Horde – This state founded in 1801 by Sultan Bukey under Russian suzerainty, and restyled as the khanate of the Inner Horde in 1812. 5,000–7,500 families of Kazakhs from the Younger Kazakh Zhuz tribe settled between the Volga and Yaik (Ural) rivers. In 1845 the post of khan was abolished, and Russia took over the region. The khanate of Tuva near Outer Mongolia. Khanate of Kashgaria – Kashgaria was founded in 1514 as part of Djagataide Khanate; in the 17th century it was divided into several minor khanates without importance, with real power going to the so-called Khwaja, Arabic Islamic religious leaders. It became the Yarkent Khanate which was annexed by the Dzungar Khanate in the Dzungar conquest of Altishahr in 1680. A Borjigin is a member of the sub-clan, which started with Yesugei, of the Kiyat clan. Yesugei's descendants were thus said to be Kiyat-Borjigin. The senior Borjigid provided ruling princes for Mongolia and Inner Mongolia until the 20th century. The clan formed the ruling class among the Mongols and some other peoples of Central Asia and Eastern Europe. Today, the Borjigid are found in most of Mongolia, Inner Mongolia and Xinjiang, although genetic research has shown that descent from Genghis Khan is common in Central Asia. The Kalmyk Khanate was an Oirat khanate on the Eurasian steppe. It extended over modern Kalmykia and surrounding areas in the North Caucasus, including Stavropol and Astrakhan. During their independence, the Kalmyks both raided and allied with Russia in turn, engaging in numerous military expeditions against the Crimean Tatars, the Ottoman Empire, neighboring Muslim tribes, and the highlanders of the North Caucasus. The Khanate was annexed by the Russian Empire in 1771.